Since a fewweeks I’ve become more and more a fan of Google Reader. This great online RSS reader supports starring items, extended search, … anything you expect from a good RSS reader. What I would like to do in the following articlesis connect to and consume Google services. Before starting I do need to point out that there is a .NET ready API written by Google, called the Google Data Protocol. This library supports many of the Google services and is very well documented. No support/documentation for Google Reader? Post to https://www.google.com/accounts/ClientLogin with login credentials. /// Client login url where we'll post login data to. /// Data to be sent with the post request. /// Get the Auth token you get after a successful login. /// You'll need to reuse this token in the header of each new request you make. // Get the response that needs to be parsed. /// Parse the Auth token from the response. // Get the auth token. // Use this token in the header of each new request. /// And we need the Auth token for each subsequent request. // Get the current post data and encode. // Write login info to the request. // Get the response that will contain the Auth token. // Check for login failed. That’s it. If you invoke ClientLogin.GetAuthToken you’ll get the auth token that can be used for each subsequent request. You’ll also get correctly typed Exceptions depending on the error you get. If the exception is not know it’s just re-thrown. /// Create a google request and get the response. // Create a request with or without parameters. // Add the authentication header. // Get the response, validate and return. /// Create a google request and get the response stream. /// Create a google request and get the page source. /// Create a google request and get the feed. // Load the stream into the reader. // Create an xml reader out of the stream reader. // Get a syndication feed out of the xml. /// Clean up the authentication token. Now that we can easily authenticate and make requests let’s make use of it. 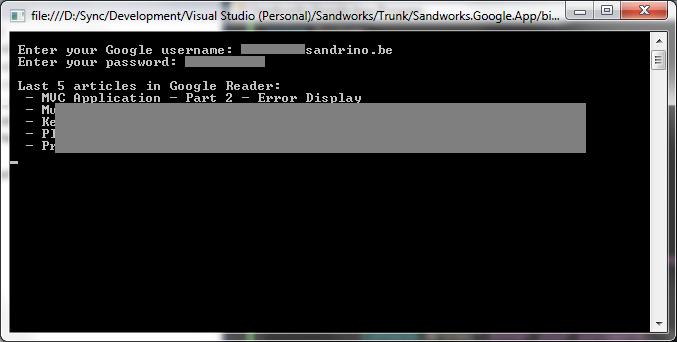 Here is an example of a command line application showing the last 5 articles from Google Reader. Authenticate using ClientLogin and get the Auth token. Create a new GoogleSession using the Auth token. Connect to Google Reader and get the last 5 articles (using a GoogleParameter). Don’t worry about the Google Reader url for now. In the next article I’ll talk about creating a class to talk to Google reader and how the URLs work.